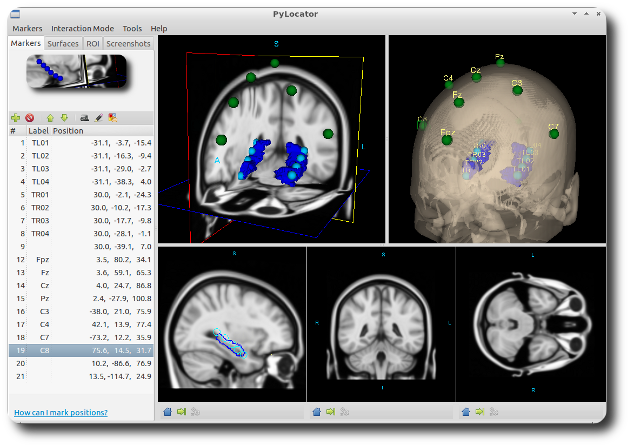 PyLocator is an application for localizing EEG electrodes from MR-images. It uses VTK to show a neat GUI for marking electrode locations in 3d-space. It is based on previous work by John D. Hunter and Michael Castell as part of pbrain, now maintained by Eli Albert. PyLocator works as a stand-alone program without any dependencies from pbrain. How can I insert markers for my MRI? How can I reconstruct iso-surfaces? How can I render regions-of-interest? Information on how to obtain and configure PyLocator correctly can be obtained in the Installation section. To get a feeling of what PyLocator can do and to get used to the controls, we recommend our little Tutorial. It provides an overview of the main features of PyLocator and has severavl screenshots. We also have a Frequently Asked Questions section. If your question is not answered here, please write me an E-Mail to info@pylocator.thorstenkranz.de . I will try to reply as soon as possible. PyLocator is distributed under a BSD-style license, and thus is free software (both in the sense of free beer and free speech). Details can be found in the LICENSE-file distributed with the source code. © Copyright 2011-2012, Thorsten Kranz. Created using Sphinx 1.0.7.